We would like to wish you and your family a Happy New Year! Your readership, support and continued loyalty is appreciated. watched several different schools Christmas events, and shared wonderful meals with friends. New year's festivities are starting. New year's Eve is one of the biggest festive nights of the year all over the world. Ecuador is no exception where it is an exciting holiday full of cultural traditions, and good luck superstitions. In Latin America tonight you will wear yellow underwear for prosperity in the New Year or red if you are looking for love & passion. At midnight you will eat 12 grapes, each grape represents a month in the New Year. You will make a wish with each grape that you eat. People of all ages participate, and the city streets, malecons and beaches are full of people. Families gather for a nice pork roast dinner on New Year's Eve. The New Year's celebrations that follow lasts the whole night where you'll welcome the first sunrise of the New Year with a delicious breakfast of ceviche or aguado de gallina – a thick chicken soup. Drinks of choice for this evening will range from hot cinnamon drinks made with sugar cane alcohol in the Andes to cold beer, champaign, or tropical fruit drinks on the coast. One of the most important Ecuadorian traditions for ringing in the New Year is the making and burning of años viejos or monigotes. These paper mache creations often charged with fireworks. They represent the passing hardships and troubles of the past year. At midnight they are burned away in bonfires in the middle of the streets. You may make one yourself or purchase one from several talented artisans who have made this a very successful business in selling hundreds of effigies. Made from paper mache or old clothes sewn together and stuffed with firecrackers and sawdust (newspaper or any other flammable material can also be used). The heads of the effigies are covered with paper mache masks, shaped into caricatures of politicians or other people who have been in the news, ( generally for scandals ) famous celebrities, cartoon characters, or many other imaginative creations. Bahia's most creative and popular this year was a life size effigie of the Hospital. The Año Viejo or Old Year has to leave a will or testament to his heirs. The testament is a list of memorable satirical events from the past year ( good, bad, funny ) – that are somewhat satirical and involves listing items and/or advice that you would leave to your friends/family/famous people so that they can have be better off in the New Year. These wills can be written in the form of a basic letter, a rhyming poem, a song, etc. They are usually very creative and very politically incorrect. There are also contests for people to submit their testaments. Another curiosity for newcomers When the Año Viejo or Old Year passes on, he leaves a Viuda or Widow, who needs financial support. During the day many guys are dressed in skimpy black dresses, nylons and wear wigs/make-up portraying provocative widows of the old year known as viudas. They will go to popular intersections or parks and stop cars/passerby's asking for money. They are often very dramatic; they dance, and also cry about how their beloved Año Viejo has died. It can be very entertaining. In our small towns we may know the guys who are dressed as viudas – which makes it even more entertaining. The money they receive will fund their New Year's party. And finally for those who like to travel at midnight you will take an empty suitcase and run around the block with it. This will bring you good travels and adventure in the New Year. Add some coins or cash to your suitcase, so you that can you also have some prosperity – or stay at 4 star hotels during your travels. Several gusano's ( worm train ) wind through the ciudela streets like a serpent undulating through the crowds, music blaring, and neon lights flashing for a 15 minute excursion. The length and visibility of the train enable it to command the streets weaving drunkenly, and sometimes circling and chasing its tail in a wide intersection. New Year's Eve in Bahia de Caraquez, Ecuador - plenty of fireworks all day long , Disney parade at mid-day, bonfires, music and dancing. Here you can purchase almost any kind of fireworks imaginable - Ecuador is right behind China in the production of fireworks. At approximately 10:30 p:m everyone in the city - young and old - walked to the malecon and lined the beaches for a fireworks display. This year as there is no gabarra the fireworks were launched from the new bridge. The evening sky originally filled with a full moon, and many twinkling stars boomed with resonating explosions and was soon filled with smoke and the pungent odour of gunpowder. South America is well known for grand fireworks displays for New Years - Valparaiso and Caracas hold some of the largest and most famous. 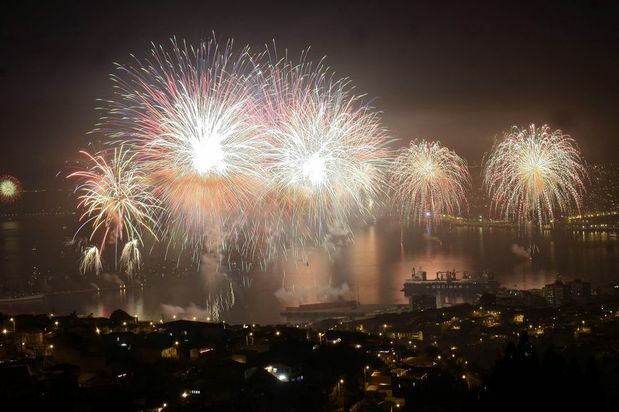 In Chile more than a million visitors are expected on Valparaiso's beaches, hills and rooftops to watch 37 tons of fireworks explode in a 22 minute display ringing in 2012. At midnight the sky filled with rockets, the street with firecrackers and screechers, and huge bonfires leaped up in the middle of the street on every block. The anos viejos have been ripped from their staging and thrown into the bonfires, shrieking as their firework stuffed innards explode. An hour after midnight the city streets were littered with the smoldering remains of the "old year" - it looked like a war zone - and everyone is ready for a fresh start to the New Year. Now the food, music, and dancing began and is expected and was vibrant until sunrise. While we retired for some rest, when we awoke the next morning festivities and music were still going strong. One of the advantages of living in South America is how free you are to live your life. Conversely if you find yourself in a difficult situation this freedom or " lawlessness " becomes a plague. Government has more important issues to deal with than interfering in community life with bureaucracy and making or enforcing regulations. There is a cultural understanding that you can live the way you want to, and your neighbors will do the same. With fireworks you can set them off anywhere, anytime to your heart's delight, and people around you will applaud, not complain. Peru and Chile are still in dispute over which country is the original producer of Pisco, a grape distilled brandy. But the pisco sour cocktail is said to have been invented by a North American bartender, Victor Morris, ("Gringo Morris") in the 1920's, at The Morris Bar in Lima, Peru. Pisco sours are notoriously strong, as Pisco varieties range from 60 to 100 proof. It's hard to improve on the beloved pisco sour, but we like this recipe made with passion fruit juice. Enjoy this new cocktail. Maracuya sours taste best if you can use fresh passion fruit juice, or frozen pulp. They are still good when made with bottled juice, but the tart passion fruit flavor will be less intense. If you can't find Pisco, you may substitute rum or brandy. Put sugar and water in a pot and bring to a boil. Boil for 2 minutes, remove from heat, and let cool. Measure pisco into blender, add passion fruit juice and lime juice. Add sugar water, ice cubes, and egg white. Blend until mixture is frothy and the ice is completely crushed and blended. Makes 4 drinks to be served immediately. Note: Some bottled passion fruit juices have a lot of added sugar, so you might need to decrease the amount of sugar syrup to compensate. To extract juice from a passion fruit: Slice in half and spoon out the pulp. Warm the pulp in the microwave or on the stove-top until it thins (almost to a boil), and then strain. Let cool. Beautiful photos looks like lots of fun we wish everyone a happy new year.